Every four years, athletes from around the world gather to compete in the Olympic Summer Games. Over the span of two weeks, athletic feats that defy comprehension are accomplished by men and women of every race, religion, and orientation, and the rest of us mere mortals can only watch in awe. To be an Olympic athlete is to dedicate your life to the pursuit of excellence, and as a viewer, to watch the results of decades of hard work manifest in feats of athleticism, grace, and power is something truly astonishing to behold, not to mention incredibly inspiring. Even more inspiring is the fact that the Rio Olympics are shaping up to be the most diverse in history, with record numbers of female and LGBT athletes competing. Team Canada’s delegation (my home country) is 60% women, with the first 12 medals of their 13 medal haul (as of my writing this) being won by women, while Team USA sent a record 292 female athletes to Rio. 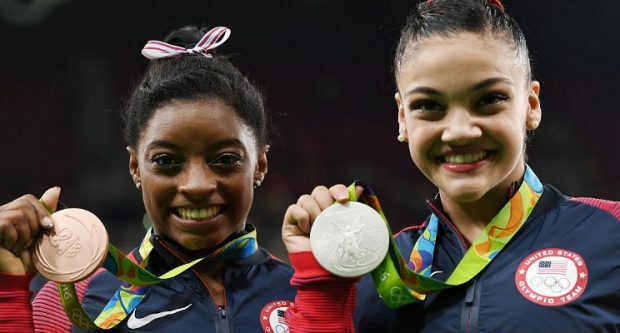 In the first week of competition, Simone Manuel became the first African-American woman to win an individual swimming gold medal, while Simone Biles proved that in the world of gymnastics she’s in a league of her own. Katie Ledecky went into her 800m freestyle final holding the top 12 best times in the world for that event and still managed to post a new world record, while Aly Raisman’s floor routine caused jaws to drop around the world. When it comes to Rio 2016, it’s clear that the women of the Olympics are killing it. There’s a lot here to celebrate, but unfortunately, if you were to scroll through the headlines being generated by the female Olympians, one dominant news story of these Games has been the sexism inherent in some of the media’s coverage of the women’s competitions. Thankfully, many people are calling out the media on this sexism, as a quick scroll through Twitter will see both men and women fighting back against the sexist headlines, coverage, and commentary that unfortunately is far too common in sports broadcasting, and which has a long, documented history at the Olympic Games. While sexism is unfortunately a problem that can’t disappear fast enough for me, one of the many memorable sights of the games has been watching the US Men’s Basketball team members cheer on the women’s beach volleyball power duo. They are so into it! Yesterday I watched with them as Kerri Walsh Jennings and April Ross defeated Australians Taliqua Clancy and Louise Bawden to make it into the beach volleyball semi-finals, and while much has been made about the media’s coverage and commentary of female athletes who are also mothers, I think it is a wonderful thing to acknowledge these supermoms. Walsh Jennings, at 38, is one of the older athletes to compete at these Games, and not only is she a mother of three, but she is a three time Olympic gold medalist, winning her last gold medal in London when she was five weeks pregnant. As a mother of a teenage volleyball player, I’m thrilled that my daughter has such amazing role models like Walsh Jennings who prove that women can be both mothers and Olympic athletes, and will be celebrated for being awesome at both. In general, sports are an incredible learning opportunity for all athletes; a place to develop not just athletic prowess, but leadership skills, commitment, character, perseverance, patience, sportsmanship, persistence, and self confidence. A recent study by EY found that participation in sports advanced women at all levels, and prepared them for a life of leadership in the corporate world. For myself personally, I was a national bodybuilding champion in Canada when I was a teenager. Believe it or not, I was twice Canada Junior Champion in my weight class, and I absolutely believe that all those hours spent in a mainly male gym was good training for life on the fixed income trading floor. Every four years, the Olympics are a celebration of athletic ability that bring together men and women from around the world, and the first week of the Rio Games has provided us with no shortage of incredible moments and inspiring performances. I can only hope that the media has realized that viewers will hold them accountable for how these Games are covered, and that from now on, they will focus on all of the positive aspects of sports and how athletics can help young men and women in so many ways beyond the confines of competition. As we head into the second week of competition, I hope we can continue to celebrate the achievements of all of the athletes and marvel at the ability of sports to bring the world together to cheer them on.